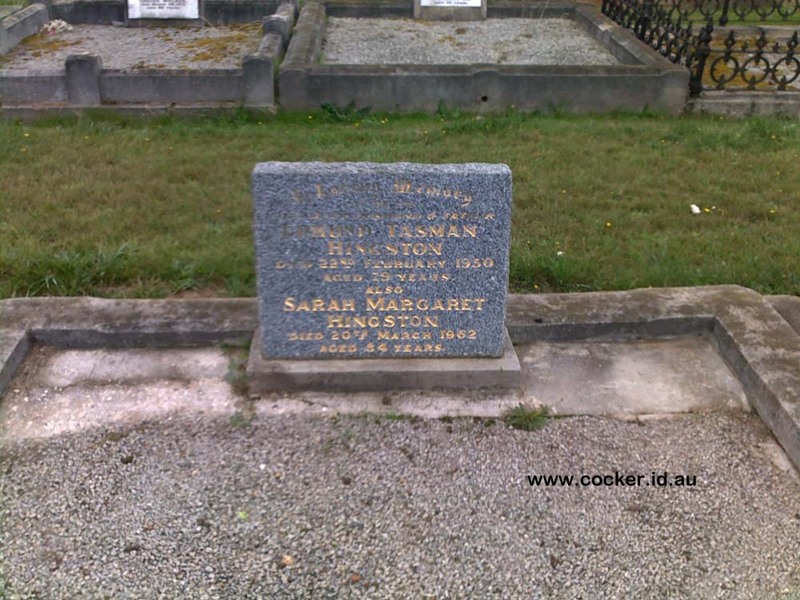 3-Sarah Margaret Walker was born on 27 Jun 1875 in Westbury, Tasmania, died on 20 Mar 1962 at age 86, and was buried in Mar 1962 in Deloraine, Tasmania. Sarah married Edmund Tasman Hingston, son of Andrew Henry Hingston and Margaret Dobson, on 26 Sep 1900 in Blackmoor, Deloraine. Edmund was born on 15 Aug 1870 in Westbury, Tasmania, died on 22 Feb 1950 in Moltema at age 79, and was buried in 1950 in Deloraine, Tasmania. Edmund was born on 15 Aug 1870 in Westbury and died on 22 Feb 1950 in Moltema at age 79. Edmund's mother, Margaret, was a sister to Henry Dobson who married Sarah Ann Walker. Sarah Margaret, William and Jane's second child was born on 27th June, 1875. On 26th September, 1900, she married Edmund Tasman Hingston, a widower with three children. They lived at Moltema nearly all their lives, farming and taking a great interest in Blackmoor Methodist Church and Sunday School, and raising seven children. Sarah was noted for her cooking, her flower garden and her readiness to extend a helping hand, plus a kind word. A son, John, carried on the farm after his father's death. 4-Nina Edna Hingston was born on 22 Nov 1901 in Launceston and died on 3 Aug 1972 at age 70. Nina married Louis Edgar Bramich, son of Andrew John Bramich and Martha Johnstone, on 22 Jun 1927 in St Marks Church, Deloraine. Louis was born on 18 Aug 1890 in Deloraine, Tasmania and died on 16 Feb 1976 in Deloraine, Tasmania at age 85. They had two children: Delma and Kathleen. 5-Delma Bramich was born on 17 Jul 1928 and died on 25 Jun 1962 at age 33. Delma married Eric McPherson. Eric was born on 24 Nov 1924. They had three children: Ian, Janet and Valma. 6-Ian McPherson was born on 19 Sep 1950 and died on 19 Jul 1967 at age 16. 6-Janet McPherson was born on 19 Sep 1950. Janet married Trevor Hingston. Trevor was born on 5 Mar 1948. They had three children: Kial, Leticia Anne and Chloe. 7-Kial Hingston was born on 16 Nov 1982. 7-Leticia Anne Hingston was born on 25 Jun 1984. 6-Valma McPherson was born on 22 May 1954. Valma married Alfred Hyland. Alfred was born on 1 Jul 1934 and died on 8 Aug 1973 at age 39. They had one daughter: Kim. 7-Kim Hyland was born on 23 Dec 1972. Kim married Allan Tibble. They had five children: Zackary, Maykeisha, Sebastian, Jonah and Caleigh. 8-Zackary Tibble was born on 14 Jul 1997. 8-Maykeisha Tibble was born on 15 Dec 1998. 8-Sebastian Tibble was born on 23 Mar 2000. 8-Jonah Tibble was born on 20 Aug 2008. 8-Caleigh Tibble was born on 11 Jul 2010. Valma next married Lester Beer. Lester was born on 27 Oct 1948. They had one son: Blair. 7-Blair Beer was born on 22 May 1981. Valma next married someone. He had one daughter: Yasmin. 7-Yasmin McPherson was born on 5 Jan 1979. 5-Kathleen Bramich was born on 17 Apr 1937. Kathleen married Brian Macrow. Brian was born on 18 Aug 1938. They had one son: Randolf Brian. 6-Randolf Brian Macrow was born on 17 Mar 1967. 4-Allen John Hingston was born on 23 Jan 1903 in Whitefoord Hills, Elizabeth Town and died on 8 Aug 1987 at age 84. 4-Valentine Victor Hingston was born on 4 May 1907 in St John Street, Launceston. He served in the Second World War. Valentine married Lorna Elizabeth McPherson on 7 Apr 1945. 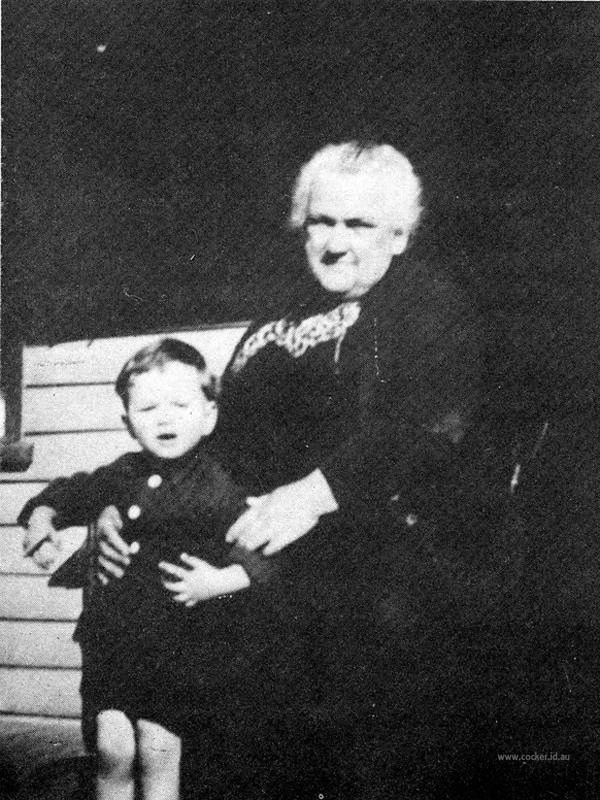 Lorna was born on 19 Mar 1917 and died on 26 Jan 1965 in Burnie, Tasmania at age 47. They had three children: Valerie Elizabeth, Bruce Allan and Stephen Roy. 5-Valerie Elizabeth Hingston was born on 12 Jan 1946. Valerie married Horace Albert James. Horace was born on 21 Jul 1938. They had four children: Brett Phillip, Gregory Paul, Peter Paul and Dean Michael. 6-Brett Phillip James was born on 8 Jun 1963. Brett married Linda Gaffney. They had one son: Sandon John. 6-Gregory Paul James was born on 3 Jan 1965. Gregory married Andrea Macrow. They had three children: Lily Elizabeth, Logan Gregory and Jesse William. 7-Lily Elizabeth James was born on 13 Jan 2000 in Latrobe. 7-Logan Gregory James was born on 12 Dec 2001 in Burnie, Tasmania. 7-Jesse William James was born on 12 Dec 2001 in Burnie, Tasmania. 6-Peter Paul James was born on 4 Jan 1968. Peter married Jan Glover. They had two children: Abbie and Olivia. 7-Abbie James was born on 18 Apr 1991. 7-Olivia James was born on 16 Dec 1993. 6-Dean Michael James was born on 27 Jan 1983. 5-Bruce Allan Hingston was born on 21 Oct 1947, died on 24 Jan 2003 in Hospital in Burnie, Tasmania at age 55, and was buried on 29 Jan 2003 in Lawn Cemetery, Penguin, Tasmania. Bruce married Dianne Margaret Jacobson. Dianne was born on 24 Aug 1952. They had one daughter: Karalyn Anne. 6-Karalyn Anne Hingston was born on 20 Aug 1974. Bruce next married Maree Astell. 5-Stephen Roy Hingston was born on 31 Mar 1954 in Latrobe. Stephen married Robyn Ansell. Robyn was born on 5 Jan 1954 in Burnie, Tasmania. They had two children: Tania June and Mathew James. 6-Tania June Hingston was born on 27 Nov 1974. Tania married Jarrad Wilson in Feb 2001 in Burnie, Tasmania. Jarrad was born on 13 Feb 1974. They had two children: James William and Evelyn Charlotte. 7-James William Wilson was born on 20 Jul 2004 in Hobart, Tasmania. 7-Evelyn Charlotte Wilson was born on 3 May 2010. 6-Mathew James Hingston was born on 2 Mar 1977 and died inHobart on 7 Nov 2013. Mathew married Tammy Mae Norris on 15 Nov 2003. Tammy was born in Queenstown, Tasmania. They had one son: Alexander Kenneth. 7-Alexander Kenneth Hingston was born in Hobart on 14 Apr 2005. Valentine next married Lorena Dagmar Chilcott, daughter of Walter Theodore Chilcott and Guida Ruby Reeder Parry. Lorena was born on 12 Jul 1909 in Deloraine, Tasmania and died on 29 Jul 2003 in Strathaven Nursing Home, Berriedale at age 94. 4-Roy Kenneth (Bluey) Hingston was born on 18 Nov 1908 in Launceston and died on 12 Aug 2000 at age 91. He served in the Second World War. Roy married Ila Wills. Ila was born on 25 Dec 1902 and died on 10 Oct 1983 at age 80. They had two children: Gerald Roy and Kenneth Edmund. 5-Gerald Roy Hingston was born on 27 Jan 1934. Gerald married Elizabeth Barton. Elizabeth was born on 23 Apr 1944. 5-Kenneth Edmund Hingston was born on 12 Mar 1936. Kenneth married Lorraine Michelle Mitchell. Lorraine was born on 15 Nov 1942. They had four children: Robert Kenneth, Wayne, Janine and Jodi Michelle. 6-Robert Kenneth Hingston was born on 24 Mar 1960. 6-Wayne Hingston was born on 25 Jan 1962. 6-Janine Hingston was born on 13 Jan 1965. 6-Jodi Michelle Hingston was born on 13 Oct 1975. 4-Una Jean Margaret Hingston was born on 16 Jul 1911 in Whitefoord Hills, Elizabeth Town. Una married Reginald Leslie Atkins, son of Leslie James Atkins and May Althea Bramich. 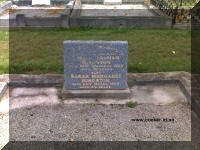 Reginald was born on 22 Nov 1912 in Dunorlan, Tasmania and died on 14 Sep 1975 at age 62. They had four children: Rex, Darrel, Margaret Althea and Beverley may. 5-Rex Atkins was born on 13 May 1940. Rex married Wilma Johnson. Wilma was born on 31 Oct 1937. They had two children: Stephen and Suzanne. 6-Stephen Atkins was born on 20 May 1976. 6-Suzanne Atkins was born on 30 Aug 1977. 5-Darrel Atkins was born on 11 Nov 1944. Darrel married Hazel Peck. Hazel was born on 13 Jan 1948. They had two children: Scott Adrian and Theresa Mary. 6-Scott Adrian Atkins was born on 2 Sep 1972. 6-Theresa Mary Atkins was born on 8 Aug 1974. 5-Margaret Althea Atkins was born on 3 Jan 1945. Margaret married John Gee. John was born on 27 Jul 1943. They had three children: Narelle Margaret, Michael John and Belinda Jane. 6-Narelle Margaret Gee was born on 10 Dec 1967. Narelle married Darren Matthews. Darren was born on 3 Dec 1966. 6-Michael John Gee was born on 24 Jan 1970. Michael married Adele. 6-Belinda Jane Gee was born on 27 Sep 1974. 5-Beverley may Atkins was born on 8 Feb 1955. Beverley married Peter Comiac. Peter was born on 3 Apr 1953. They had two children: Mathew Peter and Jayson Leslie. 6-Mathew Peter Comiac was born on 24 Mar 1975. 6-Jayson Leslie Comiac was born on 25 Aug 1977. 4-Edna Grace Hingston was born on 1 Nov 1915 in Deloraine, Tasmania and died after 1990. Edna married Thomas Archibald Chilcott, son of Walter Theodore Chilcott and Guida Ruby Reeder Parry. Thomas was born on 8 Mar 1924 and was buried on 7 Aug 1983. They had two children: Kerry Thomas and Wendy Lorraine. 5-Kerry Thomas Chilcott was born on 4 Sep 1952. Kerry married Elaine Bowerman. Elaine was born on 3 Mar 1958. They had two children: Melinda Jane and Sarah Maree. 6-Melinda Jane Chilcott was born on 9 Mar 1977. 6-Sarah Maree Chilcott was born on 9 Jan 1981. 5-Wendy Lorraine Chilcott was born on 28 Jul 1953. Wendy married Herbert Tichenow. Herbert was born on 3 Sep 1952. They had two children: Sandra Lorraine and Aaron Thomas. 6-Sandra Lorraine Tichenow was born on 27 Jul 1975. Sandra married Brett Jones. 6-Aaron Thomas Tichenow was born on 3 Oct 1978. 4-Thomas Tasman Hingston was born on 22 Jul 1917 in Moltema, died on 10 May 1995 at age 77, and was buried on 12 May 1995 in Cremated, Carr Villa Cemetery Launceston. Thomas married Margaret Florence Campbell on 29 Mar 1952. Margaret was born on 9 Jan 1924. They had three children: Margaret Anne, David Thomas and Judith Mary. 5-Margaret Anne Hingston was born on 21 Feb 1953. Margaret married Peter Roland Bond. Peter was born on 20 Feb 1953. They had two children: Katherine Jean and Andrew William. 6-Katherine Jean Bond was born on 28 Aug 1980. 6-Andrew William Bond was born on 14 May 1982. 5-David Thomas Hingston was born on 10 Oct 1954. David married Margaret Bassett. Margaret was born on 18 Sep 1955. They had two children: Thomas James and Sarah Louise. 6-Thomas James Hingston was born on 17 Sep 1974. 6-Sarah Louise Hingston was born on 13 Dec 1978. 5-Judith Mary Hingston was born on 12 May 1958. Judith married John Muir. John was born on 11 Dec. They had two children: Christopher John and Timothy.